On Saturday night I went to the Zac Brown Band concert at Fenway Park. This is my third time seeing a concert at Fenway - I saw Jason Aldean and Miranda Lambert last summer and Dave Matthews Band several years ago. Our seats this time were in a section I've never sat in before and they turned out to be great. You'll see our view in the photos below. Pre-concert selfies! This is what you do when you are waiting for your friends to arrive. Every bar was packed and the majority had long lines. So I ended up going into Bill's Bar on Lansdowne Street (since there was no line). I had never been there before but it ended up being find even though they didn't have Sam Summer or Summer Shandy! Emily arrived a few minutes after me and unfortunately Kate got stuck waiting in a line. But we did make friends with two girls who had a table and joined them so we got lucky with that! The new Country Radio Station in Boston - 101.7 The Bull was giving out these cute posters. Emily and Kate made fun of me for taking them but then of course ended up liking them! Haha! Our seats were great! The weather was beautiful. When ZBB FINALLY came on an hour after they were suppose to we were very excited! There was no opening act and the night before they went on right at 6:30 so not sure why they didn't come on until 7:30 on Saturday night. We even got in there early so we had a lot of time to chat drink. Oh and speaking of drinking, why is it that Fenway raises the beer prices for concerts? Beer is expensive enough on game days but $10 bucks for a Bud Light during a concert?! Crazy!!! I didn't participate in the Fireball. . . I'm old and just drinking a few beers and staying up until midnight is enough to do me in the entire next day. So I've learned not to make things worse by mixing my drinks! Oh and if you are wondering if Fenway sells Fireball now. . . the answer would be no. 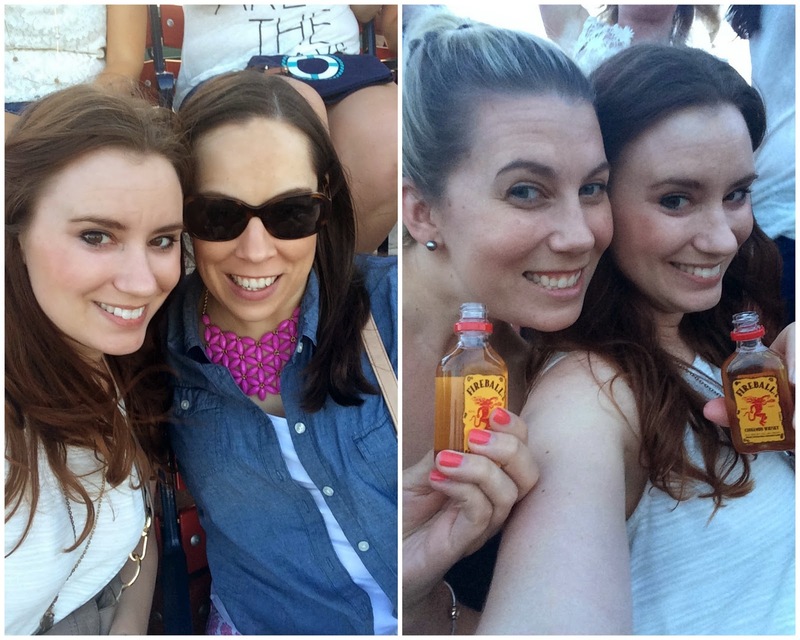 Wondering how to get Fireball into Fenway? Talk to Emily (she's a genius)! There was the most beautiful sunset and I had to run to the area behind us to take a few photos. The sky was just so pretty which wasn't surprising after the gorgeous day/night we had on Saturday! It was a great concert. They sang several cover songs, most of their popular stuff and even some of their stuff that I didn't know. They gave a little girl in the audience a signed guitar and had military come up on stage during one song which was pretty nice. All and all a great time. 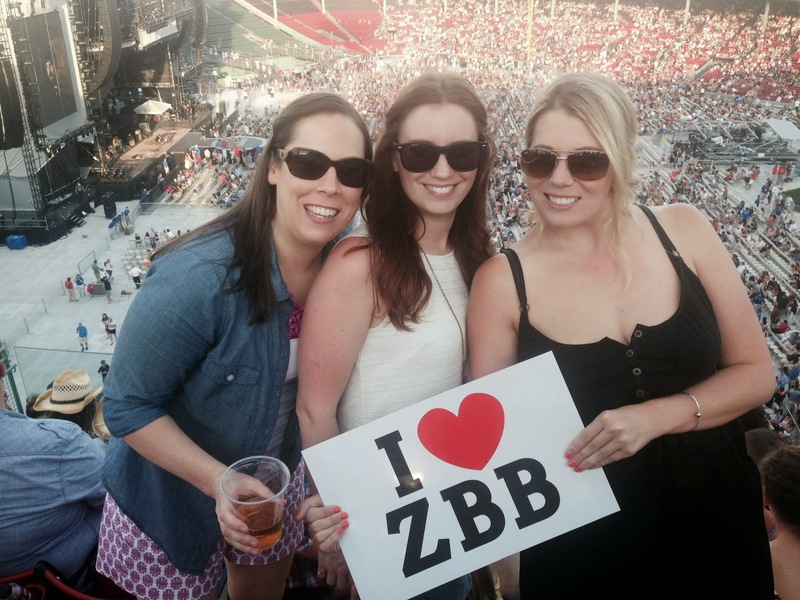 Have you seen Zac Brown Band in concert? What did you think? Fun! Looks like you ladies had an amazing time and that sunset is unreal! I feel like everyone I know was at this concert! Glad you had fun! Ah, now I get it. 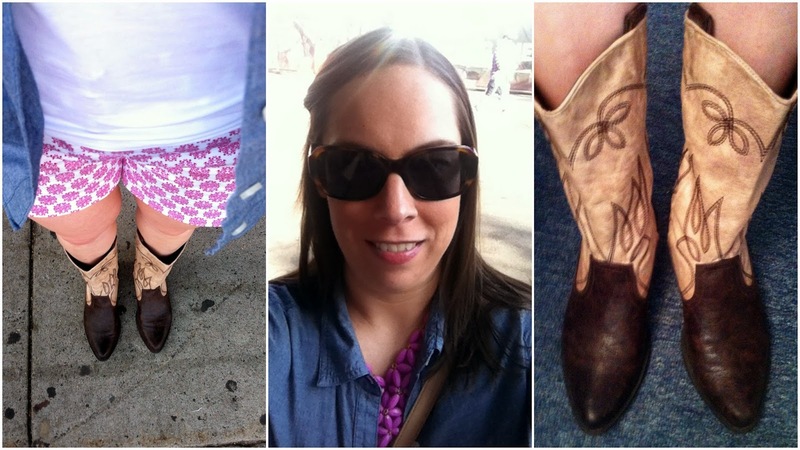 I was walking around Saturday and was wondering why everyone had cowboy boots on. Great recap of a super fun night! You all looked great!! That sky was just gorgeous. That is some expensive beer! Outdoor concerts are my fave! 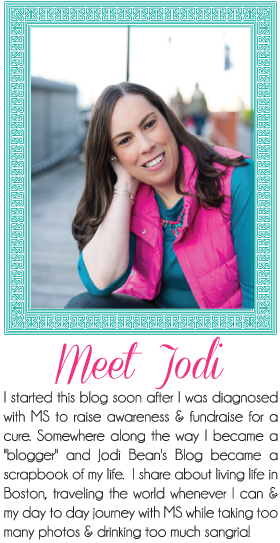 stopping by from the link up! What an awesome venue!! I've never seen them in concert but I would love to! It looks like you had an amazing time! That looks like so much fun! I would have taken one of those signs too. I haven't been to a summer concert in forever, I'm hoping a good country act comes through here on one of the USO tours.